Neck reining is among the easiest way to control the direct your horse is going in. Think of it like a steering wheel for your horse. Makes it easier to control your horse. Neck reining is one of the best control methods for horses for a reason. It's much easier to control the direction your horse moves by using neck reining. Have A Free Hand Available. A neck reined horse only really needs one hand to control it. This gives you the option of using your other hand to carry items, open gates, and perform other needed tasks without dismounting. Direct Reining - When you pull on the reins directly to tell the horse which direction to go into. Indirect Reining - When you don't need to use tension in the reins to control the direction of the horse. Neck reining is among the most improperly taught training techniques. Neck reining is an indirect reining skill, but most people incorrectly assume it uses direct reining. Proper neck reining should not apply any pressure to the horse. Instead, the horse should turn in the direction where the rein is the loosest. Remember, when using this skill you will be able to control the horse with one had, and if you are pulling both reins with one hand it will simply confuse the horse and make training more difficult. Below are the directions you need to follow to be able to correctly neck rein your horse. Be sure to follow all the directions and don't skip any steps. Getting everything correct is vital to the horse understanding what you are wanting to do. Mount your horse as normal and hold the reins with both hands as normal and start off on your horse at a walking pace. If you normally hold the reins tight, you will need to loosen the reins because it's important that there is slack in this training technique. When you turn the horse, you will want the horse to lead the turn with his or her nose (not with the tip or outside of his or her head). Lift your hand opposite of the direction you are wanting to turn and lay the rein clearly across the horses neck towards the direction you are turning. You will also need to cue with the inside rein (because your horse doesn't yet understand the trick) so you may need to apply light pressure on the inside rein to tell him or her that it's time to turn. You may also need to make other cues which alert your horse to turn such as using your seat and/or legs. Do not pull on the rein across the horses neck, because any pressure on that rein will tell your horse you want to go the other direction which will confuse and frustrate your horse. When you come out of the turn you will need to return your hands and body to the normal position to alert your horse to stop turning. You will also need to relax and add slack in the reins. Once you've gotten the hang of what to do, it's time to solidify what to do in your horse's mind. Remember, the goal of this technique is to get your horse to turn by simply laying the rein across the neck of the horse opposite of the direction you're turning. So start off by holding the reins loosely in your hand(s) and lay the rein across/against your horses neck opposite of the direction you want to turn. Give your horse a moment or two to see if they turn and if they don't gently pull on the rein on the side that you want to turn (do not pull on the rein across the horses neck). Gradually pull on the rein until your horse starts to turn. Eventually your horse will recognize the pattern of turning in the direction of less slack against his or her neck and will require less and less corrections until he or she can turn without any direct reining. 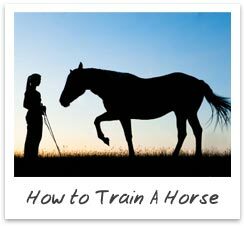 Below are some horse training tips for neck reining. Be sure to follow the tips for the best results. Keep Your Training Sessions Under 15 Minutes Long - Several short training sessions will be more effective than fewer longer training sessions. 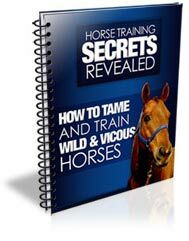 Horses don't have high attention spans so keep training sessions shorter rather than longer. Only Use One Hand When Ready - Just because this trick allows you to eventually use one hand to control your horse, it doesn't mean you should start off that way. Start off using both hands to control your horse and only begin using one hand once your horse understand what to do. Make Sharper Turns - If you are only making gradual large turns your horse may not think that you're turning and may think that you are just wondering around. Be sure to make clear turns so your horse can recognize that he or she is supposed to turn.